As a red color metamorphic rock, Tiger Eye is used as Chatoyant stone in astrology. Its golden hue is accentuated in its luster by yellow and brown stripes that give it the effect of Tiger’s eye. Hence it got its name as such. This is the stone that ignites the inner flame in humans to make them brim with boldness, brightness, and extreme patience. Tiger Eye belongs to Quartz family and is associated with Mars and Sun planets. It is extracted from crocidolite mineral and is oxidized to get its golden brown hues. It is believed that Roman soldiers used to wear this stone in battles as it was capable to bestow them with Tiger like attributes. Despite its remarkable astrological and metaphysical properties, it is a highly affordable gemstone as well. Tiger’s Eye is a most ancient talisman, mysterious and powerful, revered and feared - an “all-seeing all-knowing eye,” thought to grant a wearer the ability to observe everything, even through closed doors. Tiger’s Eye portrayed courage, integrity and right use of power. Roman soldiers carried it to deflect weapons and to be brave in battle. It has been highly regarded throughout history as a stone of prosperity and good fortune, protecting one’s resources and reflecting back malice or threats from others. 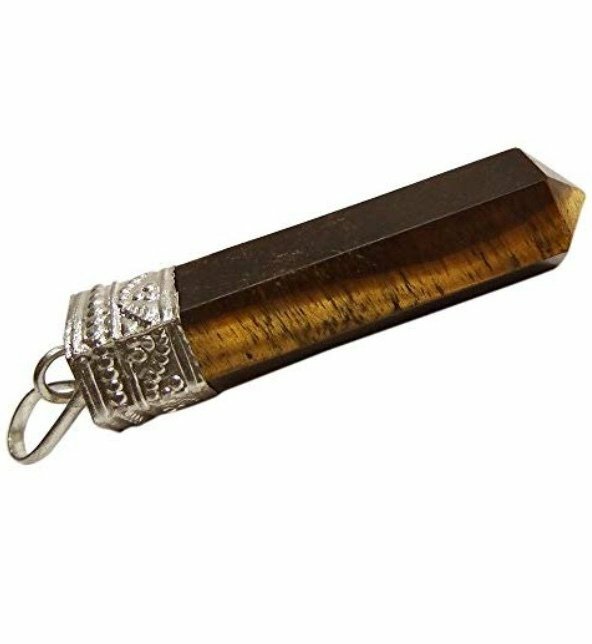 One of the most effective of the eye formation stones, Tiger’s Eye is ever vigilant, bringing sharpness to one’s inner vision and better understanding of the cause and effect of each situation. It encourages one to use their powers wisely, and allows scattered information to be brought together to a cohesive whole. Tiger’s Eye supports necessary change in all aspects of one’s life, strengthening the will and clarity of intention in order to manifest at the highest level. It inspires creativity and utilizing one’s talents and abilities, and is superb for stimulating wealth and the good judgement needed to maintain it. Tiger’s Eye warns against complacency and emboldens one to “step out of the box” in order to grow and challenge one’s artistic and creative talents, physical abilities and trying something new. Use as a support stone for determination and to overcome fear during exams, competitions, public performances, selling one’s creations in the market place, or presenting ideas in important meetings. Wear or carry Tiger’s Eye for increasing insight and perception in unfamiliar places or circumstances, and for protection from the negative intentions of others. Tiger’s Eye sharpens the senses, helping one pay attention to details and prepare for positive action. It reflects an overview of situations and assists when things are happening too fast. It is one of the best aids for resolving a crisis, and provides perfect support when one is afraid of making a wrong decision. Use for quick thinking, sizing up someone’s character, and for realizing the consequences of one’s own actions.